Constellation Crater the Cup, sits south of , on the back of the Water Snake, constellation Hydra. Crater spans 15 degrees of the Zodiac, in the Signs of Virgo and Libra, and contains 3 named fixed stars. 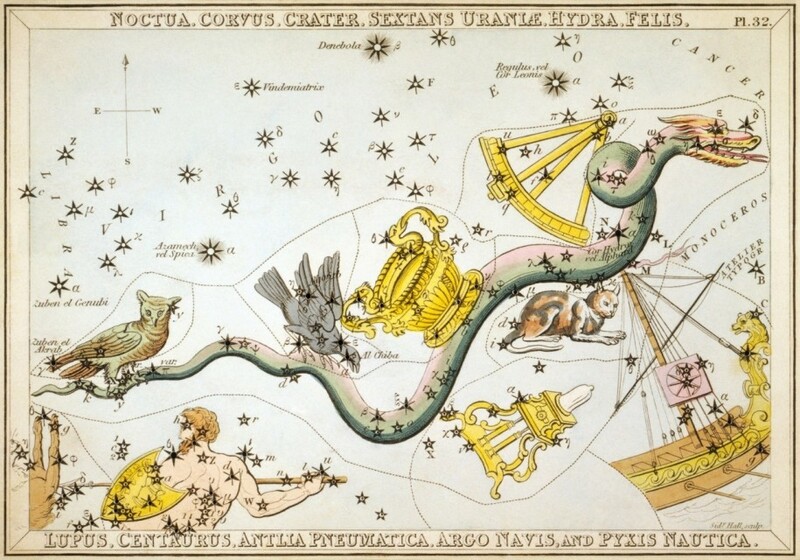 This constellation represents the cup given by Apollo to the raven (Corvus) to fetch water. He will join your vines, Bacchus [translator’s note; ‘grapevines for the production of wine’], in wedlock to your elms; or he will arrange them on props, so that the fronds resemble the figures in a dance or, allowing your vine to rely on its own strength, he will lead it to spread out its branches as arms, and entrusting you to yourself will forever protect you from the bridal bed, seeing how you were cut from your mother. This is no fabled wine-cup of Bacchus; but it is “The cup of His indignation” (Rev 14:10); “The cup of the wine of the fierceness of his wrath” (Rev 16:19). This is what we see set forth in this constellation. The Cup is wide and deep, and fastened on by the stars to the very body of the writhing serpent. 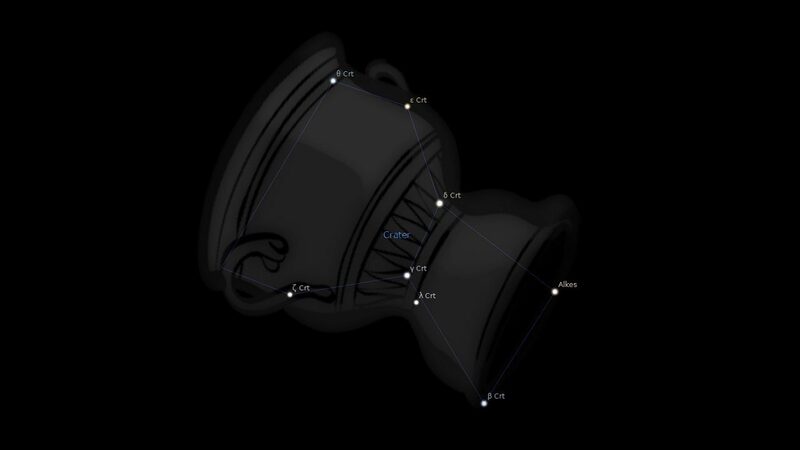 The same stars which are in the foot of the Cup form part of the body of Hydra, and are reckoned as belonging to both constellations. 3. Star Names, Their Lore and Meaning, Richard Hinckley Allen, 1889, p.182-184. 5. The Witness of the Stars, E. W. Bullinger, 40.2. Crater (the Cup). 6. The Living Stars, Dr Eric Morse, p.170.